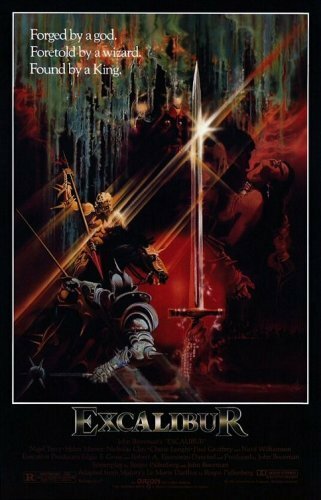 Excalibur (1981) Orion Films. Directed by John Boorman. I remember seeing this on first cinematic release back in the day, and it’s become something of a guilty pleasure that I like to revisit every year or so. It’s cheesy, at times very theatrical but there’s something about it I really love. English director John Boorman created (for its day) an incredibly violent yet a very tender retelling of the Arthurian legend. The late Nigel Terry stars as Arthur and brings both tremendous strength and an aching innocence to the role and is surrounded by a “who’s who” of the cream of UK’s up and coming thespians, including Liam Neeson, Ciaran Hinds, Gabriel Byrne, Cherie Lunghi and Patrick Stewart. But the reason I continue to re-watch this is the brilliant portrayal of Merlin by Nicol Williamson. He eats up the screen, and his scenes with a very young Helen Mirren as Morgana Le Fey are simply riveting. Legend has it that Mirren and Williamson absolutely loathed each other at the commencement of shooting but became “very good friends” by the time it was completed. Irrespective, their performances are outstanding. The original music by Trevor Jones is for the most part excellent but there’s a few times where I feel it intrudes on the scenes. Much of the action is informed by the sumptuous cinematography of Alex Thompson and it’s no surprise to me that he was nominated for an Academy Award for this film. The Irish countryside stands in for Arthur’s England and all its grey, bucolic green and muddy glory is well on display here. Interestingly, I recently read that Boorman had chosen many of the sites for his Lord of the Rings project, which never got off the ground. The similarities as well as the appeal of Ireland isn’t lost on me, and I wonder if Peter Jackson ever watched this and had similar thoughts. Yes, the practical effects and fight scenes are dated and at times it looks and feels more like stage play but to my eyes it’s the best cinematic retelling of this classic tale – far more entertaining and engaging than either Antoine Fuqua’s King Arthur (2004) or Guy Ritchie’s King Arthur: Legend of the Sword (2017). I can’t help but feel that Boorman has a real fondness for the Arthur myth, which shows throughout. Have you seen Excalibur? Let me know what you think. Also, if you have particular films you’d like me to watch, let me know – I’ve always got time for a good movie!